Preformed Windings, a specialist in high quality coils for traction motors, high voltage motors and generators, is investing over £2m in a move to a new custom fitted facility, set to be at Waleswood in Rotherham. 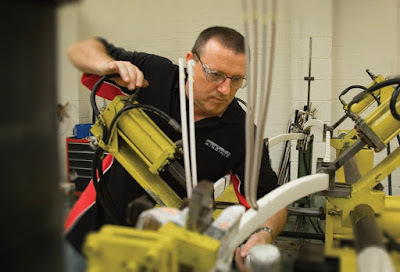 The Sheffield firm was acquired by Clyde Blowers in July 2014 and has seen a tripling in demand for its precision high voltage coils. Clyde Blowers Capital is a mid-market investor in industrial businesses and has committed significant investment to grow the company. Exporting to OEMs, repairers and end users worldwide, customers of Preformed Windings are in the power generation, electrical machinery, general engineering, oil & gas, water, transport, chemical, paper, extraction and shipping industries. The firm has recently applied for signage and new external stores at Unit C of the successful Vector 31 development that was developed close to Junction 31 of the M1 by the Langtree Group (now known as NetworkSpace). The firm said: "The new facility is 90% larger than our current premises and will provide enough capacity for the next few years of anticipated growth. The new facility will be fitted with the latest cutting, straightening, looping, shaping and taping machines and has been designed using advanced value stream mapping and lean principles. This all adds up to a coil offering that's already industry leading getting even better in terms of quality, service and speed of production." Dedicated areas for high voltage coils, traction coil production, upgraded test capability and the ability to super fast-track coil batches to meet high voltage machine rewinds will all feature in the new facility. Investment is also being made to strengthen the ERP and CAD capabilities as well as staff recruitment and development.